Branson is not only known for world-class live music and entertainment, but it’s also has an abundance of art galleries. If you love arts and crafts, then don’t miss to visit the Ozarks Arts and Crafts Show this fall in Branson. During this event, you will find more than 350 booths set up during the course of this three-day festival. Created by the Ozarks artisans and craftsmen, these arts in Branson are the best works on display for thousands of attendees every year. This art festival features a wide display of some of the best creations of Ozarks artisans in Branson. During the fall show of a variety of arts in Branson, you’re sure to appreciate the great display of the beautiful works of art that are created by Ozarks artisans and craftsmen in this amazing place. This event will give you the chance to get a head start on your Christmas shopping and the opportunity to see real artists and professional craftsmen demonstrate how they skillfully create their works of art in front of you. This craft show also features several food vendors selling everything from hamburgers to homemade jams and freshly fried homemade potato chips. Don’t miss the giveaways and drawings throughout the three-day event as this will surely give a fun time to everyone. Even if you don’t have money in your pocket, you’re sure to enjoy a great time walking through the rows and rows of booths with a wide display of many unique art works that can’t be seen anywhere else. Shoppers and crafters alike will find this event a nice place to buy and sell unique piece of arts in Branson. The Arts in Branson show is another great event in some places in town where you’ll find beautiful works of art by Ozarks artisans that include paintings, sculptures and other art forms. Visitors who come to the show will see many of the displays throughout the place and they can enjoy more free activities around the area. In the theater lobby of Yakov Smirnoff, the famous Russian comedian, you will find displays of his personal oil paintings, many of the images express freedom. Yakov’s painting “America’s Heart” was displayed as a mural in New York City at Ground zero after 9/11 incident. Portions of that mural are on display in his theater in Branson. This talented entertainer is also an accomplished artist displaying his arts in the theater where he performs. Andy Williams is another celebrity in Branson who has a passion for collecting beautiful works of art. The sculptures created by Henry Moore, Willem de Kooning and Jacques Lipschitz including an impressive collection of Navajo blankets are amongst the beautiful art displays in the lobby of his Moon River Theatre in Branson. You will also find interesting photos on display in the lobby such as Who’s Who of ‘60s and ‘70s television history in more than 70 photos taken on the set of the Andy Williams Show. You will also see large paintings by Robert Motherwell, Michael Goldberg, Jack Bush and Dan Christianson that are hang inside the theater, as well as a collection of 13 antique wedding kimonos from Japan. Even Andy’s Moon River Grill located just across the street also features many paintings from his collection. The theater lawn also features a majestic sight of Mansion America’s life-size bronze equine sculptures. The three running Arabians were created by sculptor Veryl Goodnight. A small pavilion at the Shoppes at Branson Meadows off Gretna Road shelters a bronze eagle that sets atop a four-sided monument. This unique exhibit is a tribute to all veterans and dedicated by Bob Hope and the Children of the Ozarks in 1995. The history of the Ozarks people can be traced through arts and crafts created by local residents. For generations, people of the Ozark Mountains made what they needed to survive in the hills. The crafts that they have learned to create included quilts, baskets, pottery, glassware, wrought iron and more. Up to this time, craftsmanship in the Ozarks is still an integral part of the area’s culture and is celebrated through festivals and exhibitions of arts in Branson. Each spring, you’ll find Plumb Nellie Days in downtown Branson showcasing arts and crafts that are created by local residents in the area. When you visit Silver Dollar City theme park, you can have the opportunity to watch craftsmen demonstrating their skills on basket weaving, ironworking and woodcarving, glass blowing, among others. The National Harvest Festival held at Silver Dollar City in the fall brings in dozens of additional artists and craftsmen to demonstrate their skills. Visitors can buy one-of-a-kind heirloom-quality items made by the craftsmen as souvenir of their visit to Branson. You will also find old-time crafts at the Shepherd of the Hills Historic Homestead where century old art works are on display daily. 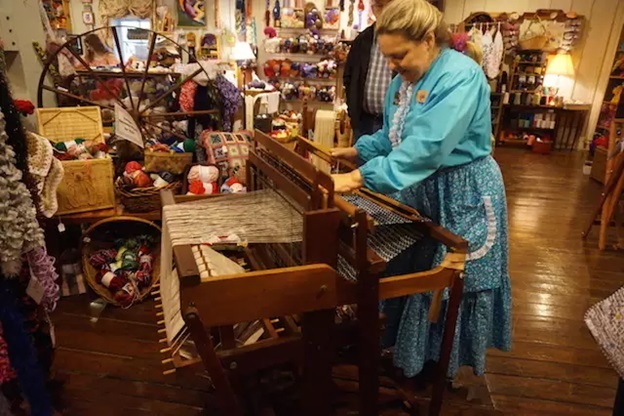 The new Branson Mill Craft Village is also a great place to visit where you’ll find great features of unique works of art from more than 100 artisans, many of them working on site allowing visitors to see their skills working on wood, textile, glass and leather art and crafts. While the city of Branson is known by many visitors for its music shows, bright lights, and family-friendly live performances, it is also making a reputation by itself for its dedication to arts – and every year the arts in Branson are growing. The unique craftsmanship unfolding in front of you, is one of the many free Branson activities enjoyed by millions of visitors each year. While many of Branson visitors are aware of the traditional Ozarks’ crafts at their disposal, they can have the chance also to see a variety of fine art galleries exhibiting breathtaking works of local, regional, national and even internationally-acclaimed painters, sculptors and potters. As one of the most popular attractions in Branson, Silver Dollar City is known by thousands of visitors for its historically-themed rides and shows. First-time visitors coming to this place may be surprised to see many craftsmen and artisans demonstrating their skills in making an assortment of Ozarks’ crafts. Inheriting their talents from pioneering families of the 1880s, these artisans at Silver Dollar City included talented quilters, glass blowers, bladesmiths, silversmiths, woodcarvers, potters and furniture makers. If you love jewelry, be sure to visit Silver Dollar City and see silversmith Don Bair, who creates fine jewelry right in front of you, or bladesmith Ray Johnson, who has been making knives for over three decades using materials such as stone, bone, chains and steel. 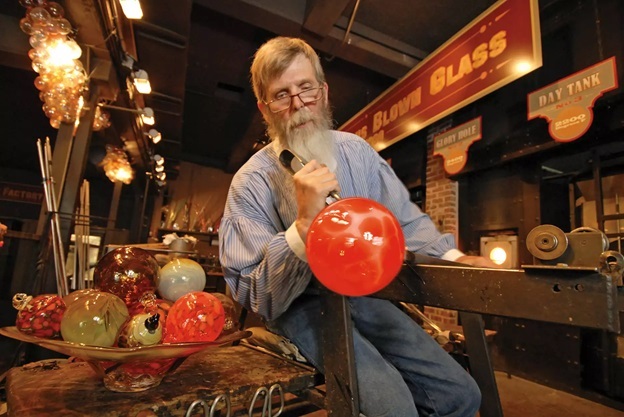 Other artisans that you can find at the park include blacksmith Wayne Rice, glassblower Todd Nelson, glass cutter George Stiverson, potter Jeff Walker and many other master craftsmen. The Gallery at the Lake is another great place to visit in the Ozarks where you see features original works of art in a wide range of mediums, including oils, watercolors, acrylics, etchings, pencil and ink, from locally, nationally and even internationally-known artists. The gallery not only features contemporary, abstract, landscape and floral artwork, but also has a great display of sculpture, pottery, stained glass, copper work and even candles. Some of the artists featured by the gallery will even create customized artwork, perfect for art lovers looking for a specific Ozarks’ style to display in their homes. As Branson is home to art galleries, festivals, and theaters that feature great display of art works, this is the perfect place to meet the Ozarks artisans.